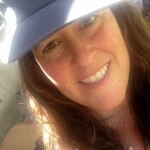 Ready To Pop, About To Pop, She’s Going To Pop…. 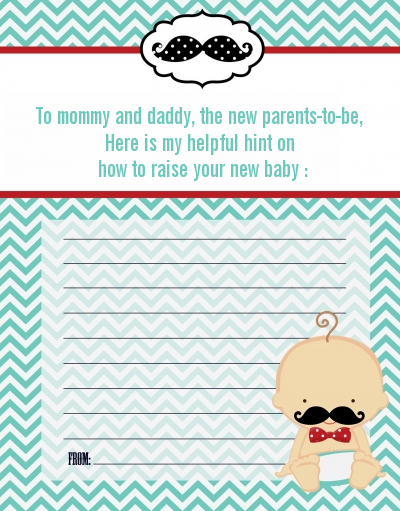 No matter how it’s said, there is a baby on the way. 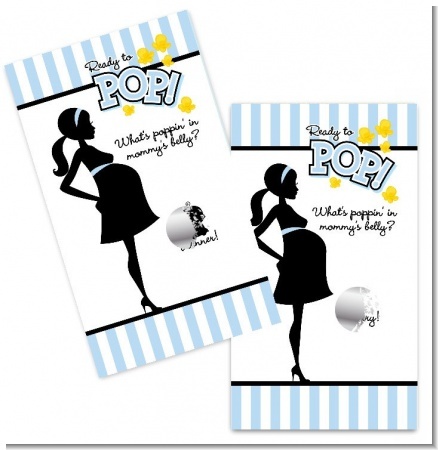 We introduced our Ready To Pop design back in 2008. We took a big risk on this design. 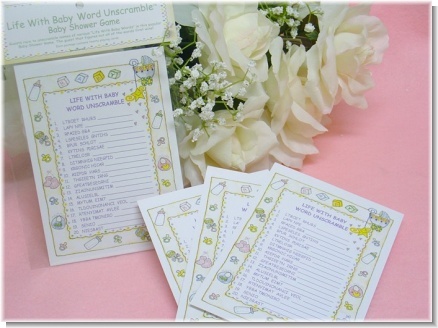 It was bold with colors that were not your traditional pastel palette. 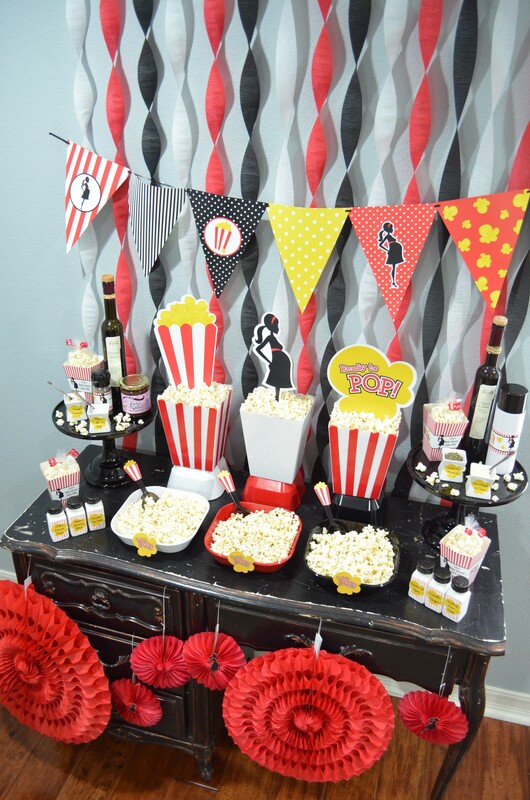 The mom was very chic looking and who would choose popcorn over pacifier and diaper designs. The risk definitely paid off. 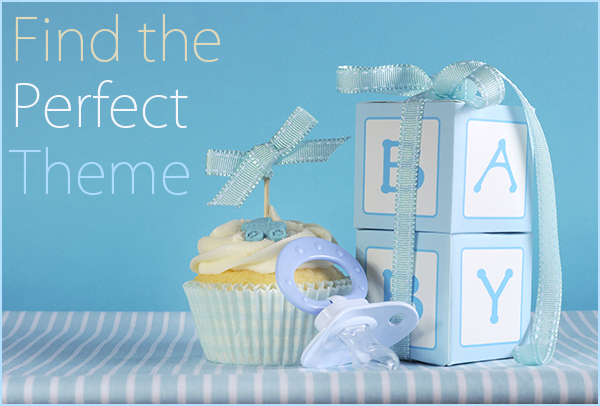 Our Ready To Pop Baby Shower Theme is still our top seller after all these years and we since introduced seven new color combinations to this collection. 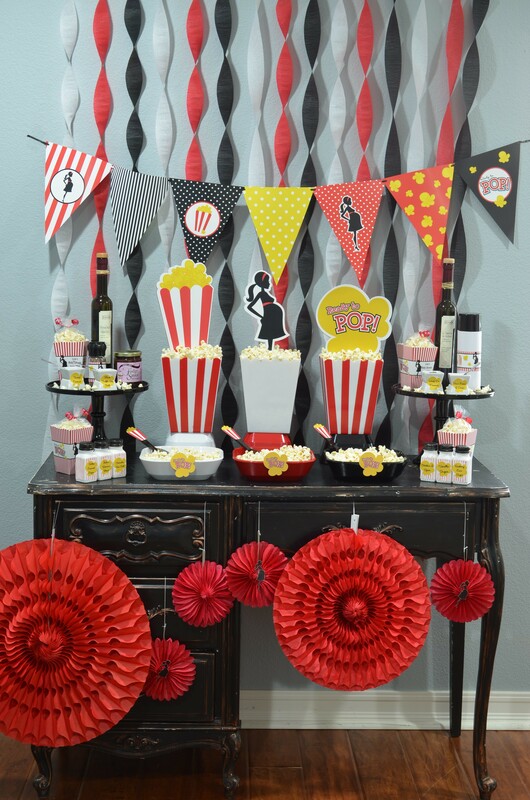 We absolutely love this design and we want to share with you all the cool ideas we have to make your party “POP”. 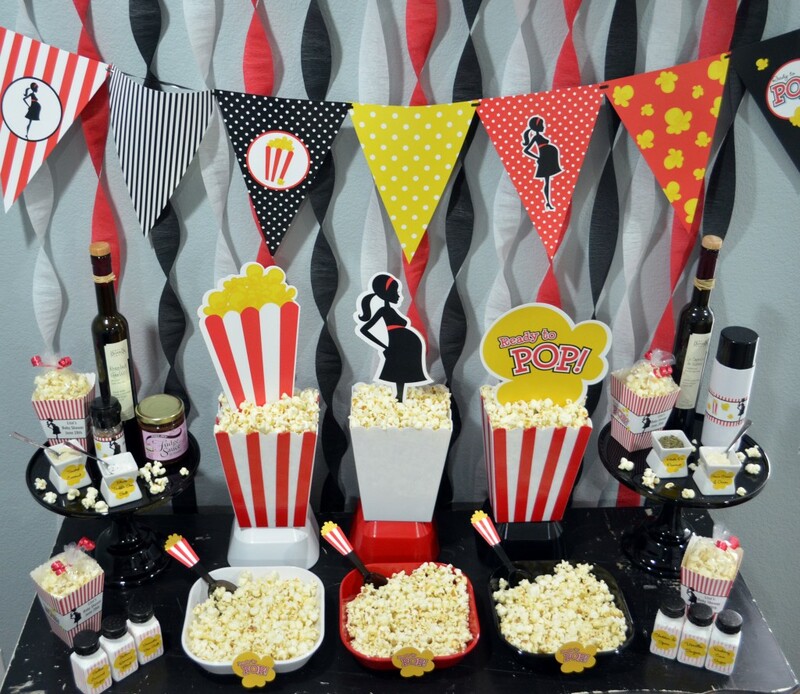 This popcorn bar is a perfect way to incorporate your Ready To Pop theme at your upcoming baby shower. We mixed different elements of black, white and red. Of course, center stage is the popcorn. 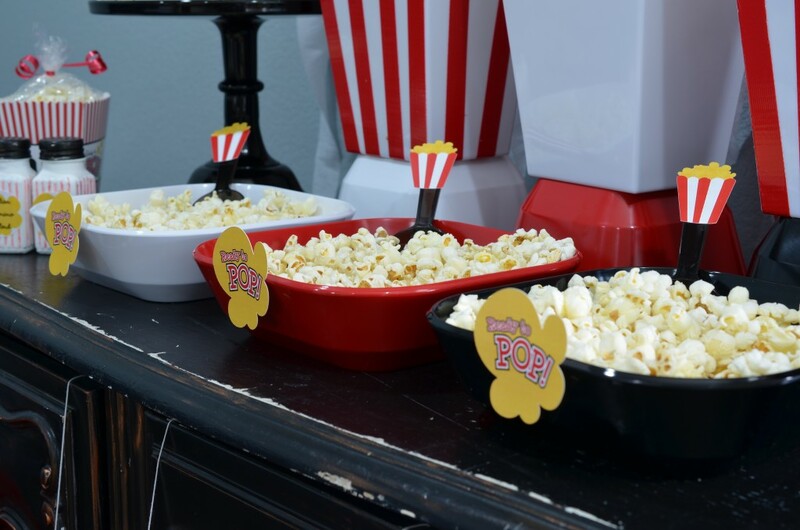 We purchased the melamine serving bowls and popcorn stands from Target. They were the perfect colors, how can you resist. We placed each bowl in front of our popcorn boxes. We purchased smaller bowls and place them upside down to give the popcorn boxes height. 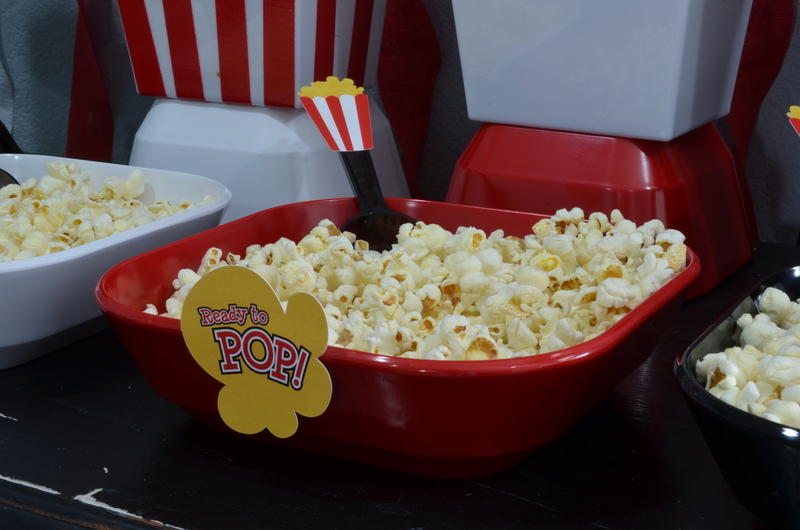 We added our Ready To Pop cutouts to the front of the bowl. You can also use them as food titles if you were serving different types of popcorn. 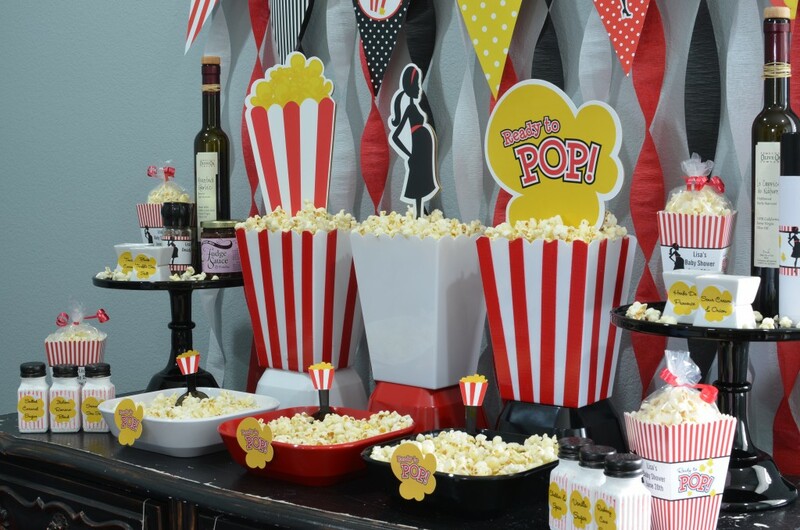 We stuck with traditional air popped popcorn for this event. The black plastic scoops came from Party City. 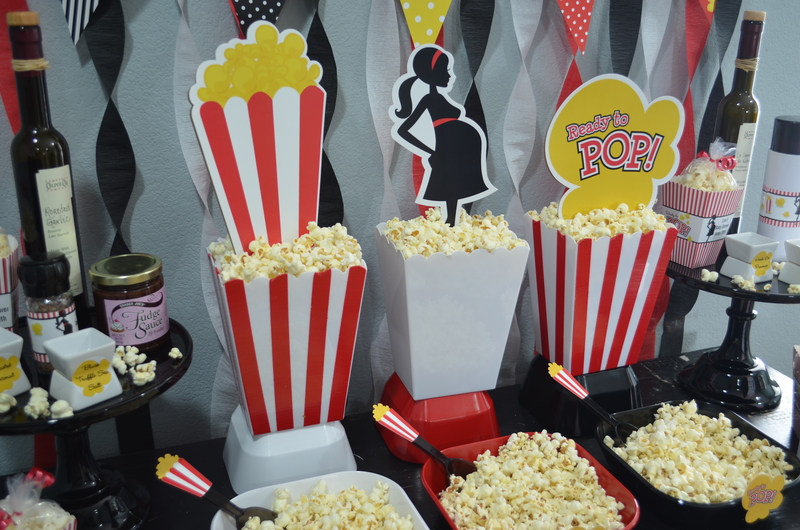 We hot glued our popcorn cutouts to the scoops to add a little pizazz. Speaking of Popcorn Boxes. The three popcorn boxes were purchased at The Dollar Store. We took red duct tape and cut out 12-inch strips and placed them on the boxes to resemble a popcorn box. We loved how they came out. 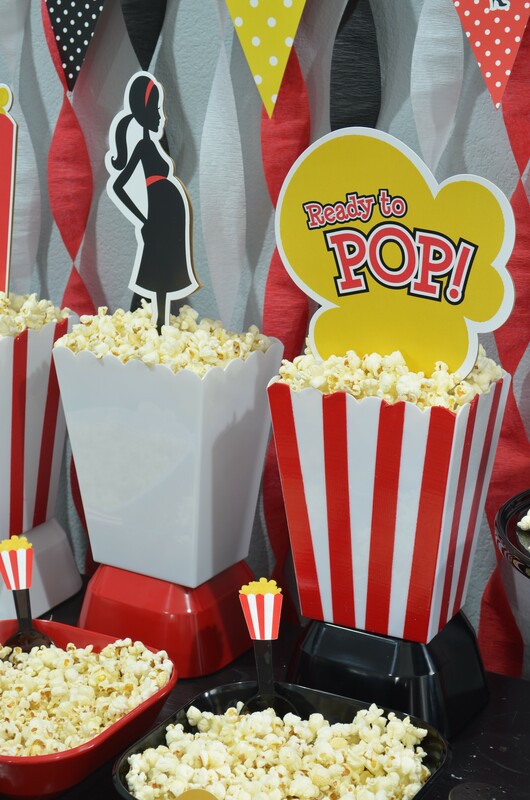 The popcorn boxes are filled with fresh popcorn and we took our Ready To Pop Silhouette Cutouts and glued them to a long lollipop stick. 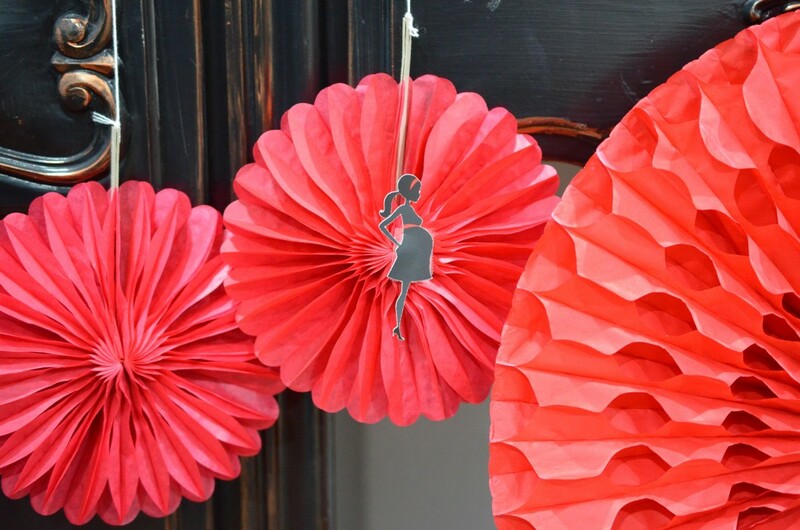 Papermart had these Red, Black and White crepe paper streamers. It is a really inexpensive way to decorate a wall. 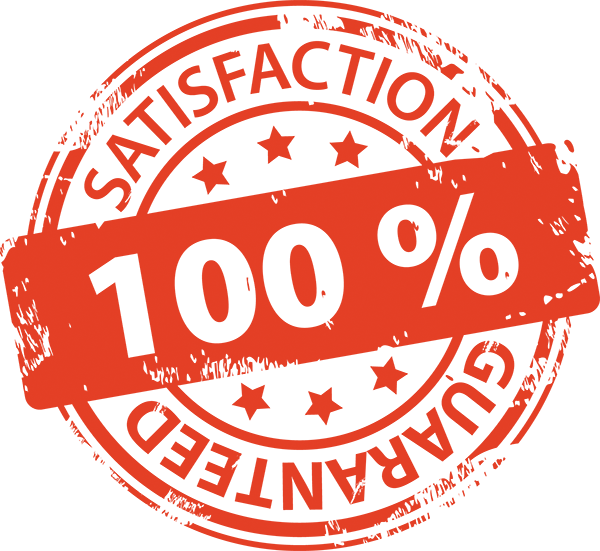 We took a four-foot strip of each color and taped it to the wall about an inch apart. Gently twist the streamer and tape the bottom so the twist stays intact. Continue the same color combo across the wall. 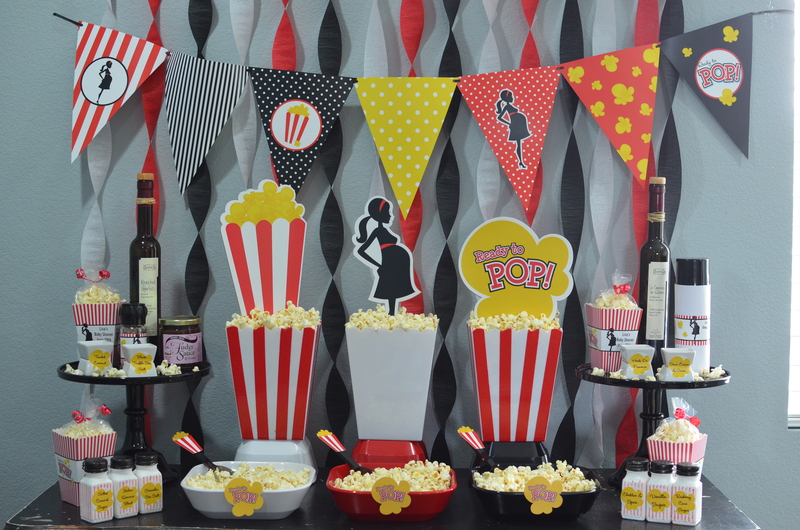 Our Ready To Pop Themed Pennant Set was a great addition to the backdrop. We just used black curling ribbon and threaded the pennants through and viola, the backdrop is complete. 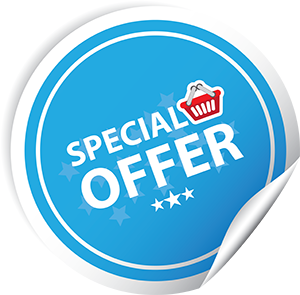 We are so excited that Papermart now offers these fantastic red honeycomb fan decorations. We purchased all three sizes and had them randomly hanging from the table. We decorated a few with our pregnant mommy silhouette. 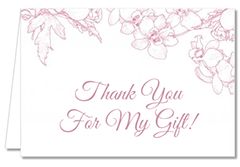 The milk glass pedestal cake stand we used were from The TomKat Studio. The stands are so versatile. No cake at this Ready To Pop party. Our Temecula Olive Oils were placed on the stand. We took our Ready To Pop Water Bottle Wrap to decorate our Coconut Oil Spray. 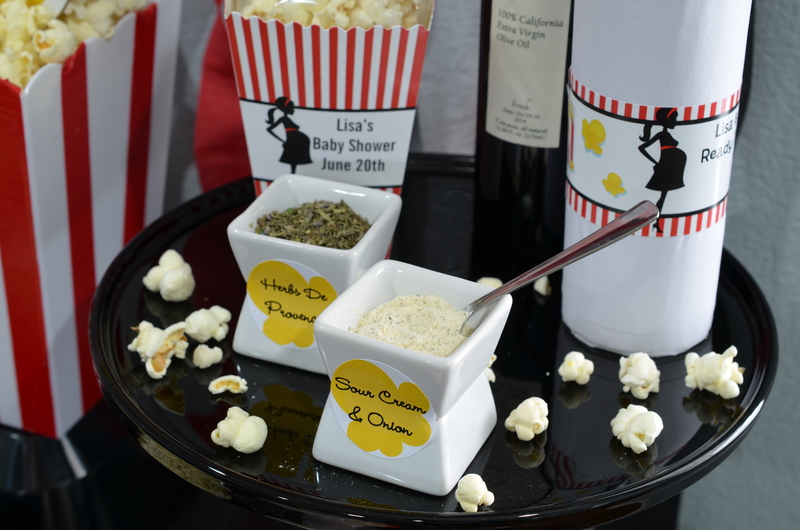 These mini white porcelain square dishes from World Market were perfect for our herbs and toppings for our popcorn party. We took two of the dishes and placed them on top of each other to create a cute stand. The round stickers were placed on each set to keep the stand together. 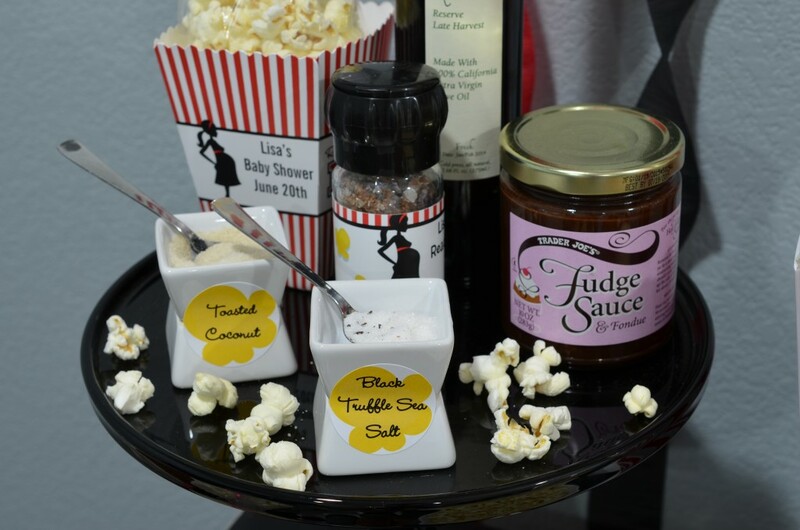 Also on our cake stands are our personalized About To Pop Popcorn Boxes. We are always amazed how many cool things you can find at The Dollar Store. 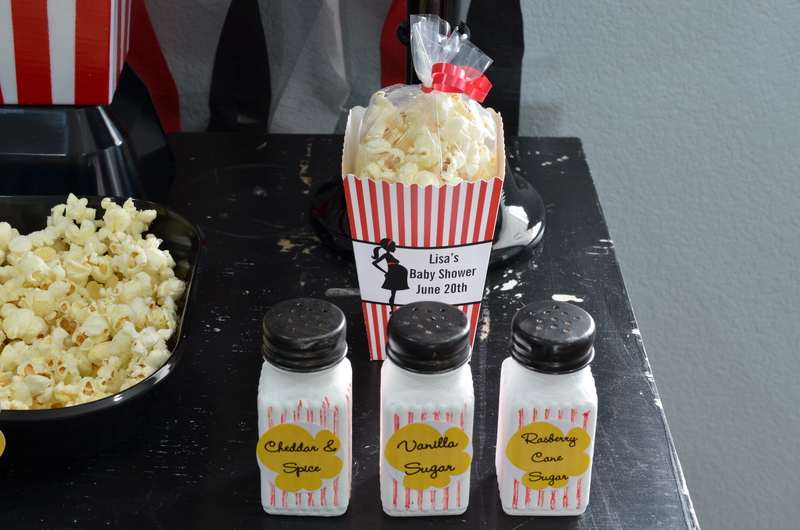 These glass salt and pepper shakers were perfect for our popcorn party. We painted them with white chalk and finished them off by taking a red sharpie marker and making lines in the groves to resemble a popcorn box. 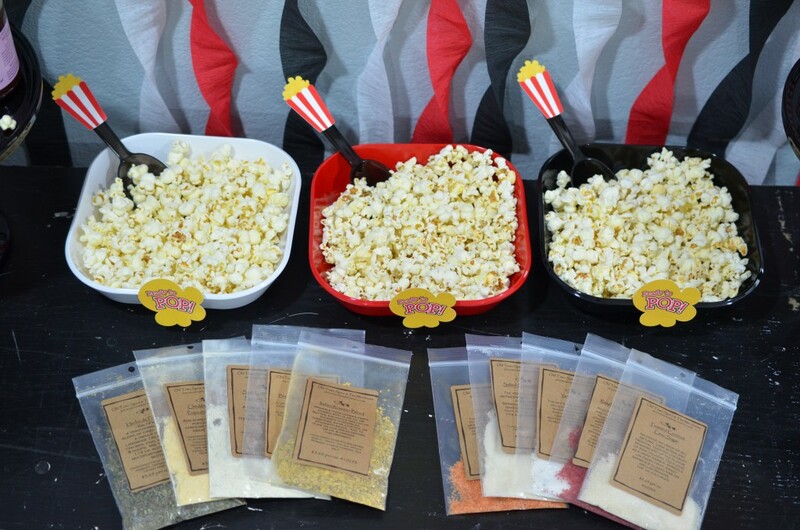 We used ten different toppings for the Ready To Pop Popcorn Party. 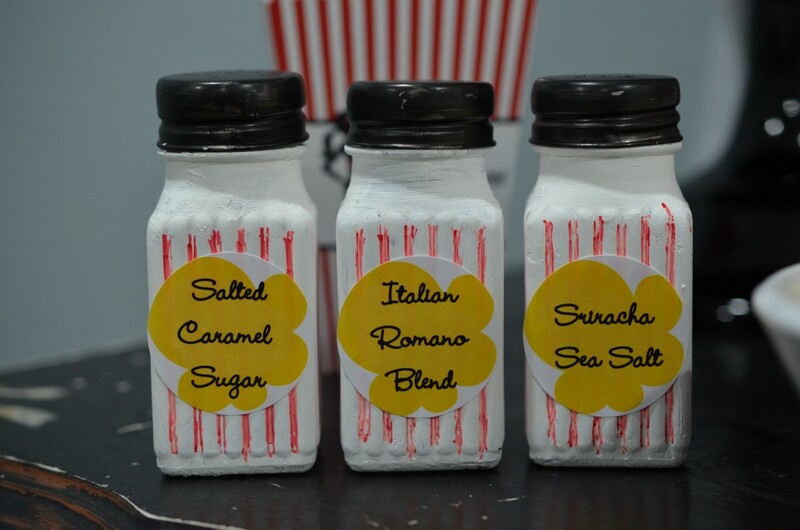 We went to our local Spice Merchant Store and explained to them that we needed seasonings for a popcorn party. 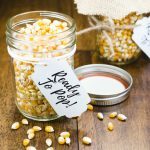 Mixing oils and seasoning on the popcorn was a different spin on your everyday popcorn you can purchase at your local grocery store. Here is a list of the seasonings we used. 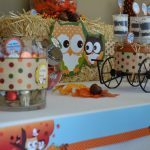 We hope that your Ready To Pop Party is such a hit that the “POP”arazzi shows up. 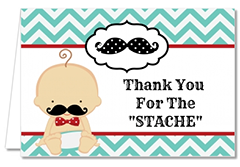 Stay tuned for more ideas as we are going to be showcasing our other colors with different decorating ideas and tips.